The sun reflects off the propeller of a waterplane that tours around the 30,000 Islands of Parry Sound in Ontario, Canada. An interesting picture of the propeller of a waterplane and the internal mechanics surrounded by the bright colors painted on the waterplane. This waterplane flies above the 30,000 Islands of Parry Sound in Ontario, Canada which lets one get an aerial view of the stunning Ontario landscape below. Waterplane, 30,000 Islands, Parry Sound, Ontario, Canada, North America. 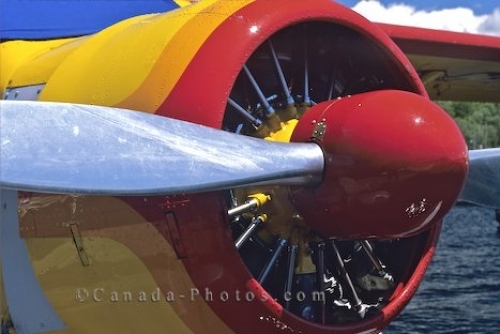 Picture of a waterplane propeller at one of the docks in the 30,000 Islands in Parry Sound, Ontario.